Ang Babu and Kanchhi, husband and wife lived in their 1 story house with their in daughters Sani, 19 and Yangdi, 17. Their son Pemba, 27 works in Malaysia. 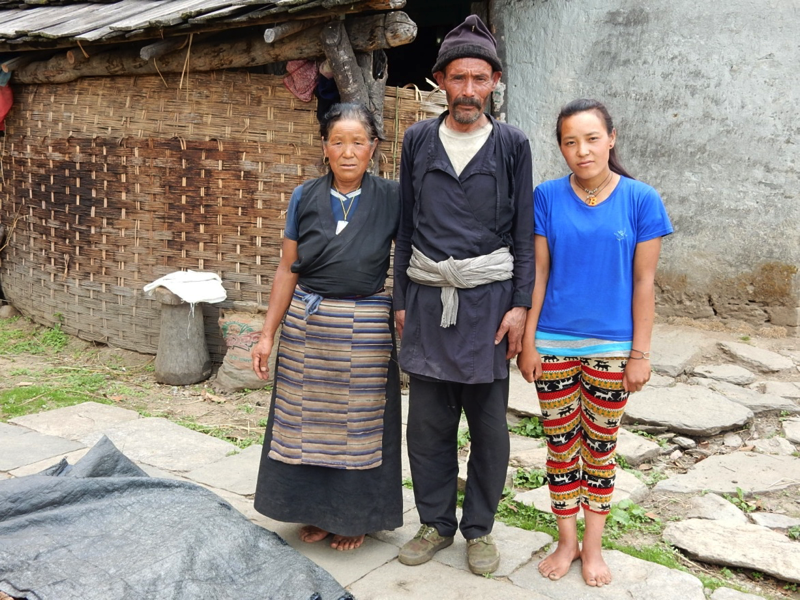 When the first quake hit, Ang Babu, Kanchhi and their daughters were all inside the house. Ang Babu was sick, but they all immediately went outside. When the second quake came Kanchhi was in the field with Sani, Ang Babu was on their patio and Yandi was in school. After the first quake, they built and moved into a temporary shelter where they eat, sleep, and live. They never go back into their home for fear it will collapse while they are in there. Through a bout of laughter, Ang Babu said he’s not scared anymore.